These are incredible and I love these gluten-free delicious treats always turn out. 1. Heat pancake griddle. When hot, grease with butter or non-stick cooking spray. 2. Mix the almond flour, salt, and baking soda in a medium-sized bowl. 3. Add the eggs, honey, and water into the flour mixture. Combine thoroughly. 4. Spoon the batter onto hot griddle. Cook according to the manufacturer’s instructions. 5. Serve warm with syrup of your choice. These pancakes are a delicious way to start the day! They can also be frozen and easily reheated in a toaster oven for a quick treat anytime. These pancakes look great! I will try them the next time Mom is in for a visit. These look sooooo delicious! Can’t wait to try them next time for a Sunday morning breakfast. Tina, I have tried using almond meal in a number of cookies but not pancakes. These are going to be my first time at this.My 3 kids area allergic to a number of ingredients so this is truly helpful as is your whole site. Thanks! Shirley G.
Almond flour is a fantastic and delicious substitute and i really want to try this receipe, it seems delicious! These look really great – I’ve made almond flour pancakes before, but they didn’t turn out as nice as yours. I’ll have to try this recipe ASAP! I’m new to Gluten intolerance because of my Daughter. My question is What is agave nectar and were do you get it. I haven’t seen it in the gluten iles at the stores. Great pancakes. Since im on keto i didnt used honey, instead i added splenda. Hi. I purchase AGAVE nectar at TJ Maxx. They almost always have it in stock in the little section where you find a lot of “different” foods, teas, sweeteners, etc. 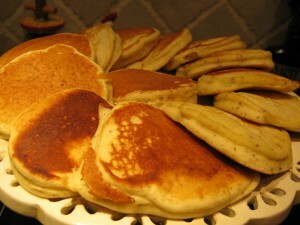 These pancakes are wonderful! They have become my husband’s favorite. I served them to guests last weekend and they also said they are fabulous! I use sparkling water, instead of plain water, and it gives them a little lighter texture. The only problem is that the recipe makes only enough for one serving for my hubby! Need to double it if anyone else is eating! Thanks for sharing. Hi there. I am going to try these tomorrow morning. I was wondering if you can use this recipe for waffles as well? I haven’t read all the comments, so I am sorry if that was asked already. i am sure you could. I haven’t tried using them for them though. Mix may be too watery for waffles I would make sure to whip eggs very well to avoid this.